A 21st century interpretation of the classic social club. We're creating a refuge in the busy city of San Francisco, a place where you can feel comfortable, appreciated, and surrounded by the best the world has to offer. But we aren't taking this stuff too seriously. We're keeping it light. We're keeping it fun. We acknowledge tradition, but we won't be trapped by it. From shoes, suits, and cigars, to beer, bumper pool, and blazers, life can be about appreciating the best of the best. Feeling comfortable in one's clothes, in one's skin, and in one's environment is what really matters. The 10th floor bar combines the exclusivity of a classic private social club with the genuine camaraderie of a neighborhood pub. Enjoy ample seating around the large island bar for front row service or grab a table in the lounge for stunning views of a San Francisco icon, the Pyramid Building. At any given time, you'll find members entertaining friends, family, colleagues, or clients over craft cocktails, a fine glass or bottle of wine, a dram of whiskey, and great food from the Club's kitchen. Surrounding the main bar are the private parlor rooms, Billiards Room, and Whisky Corner. 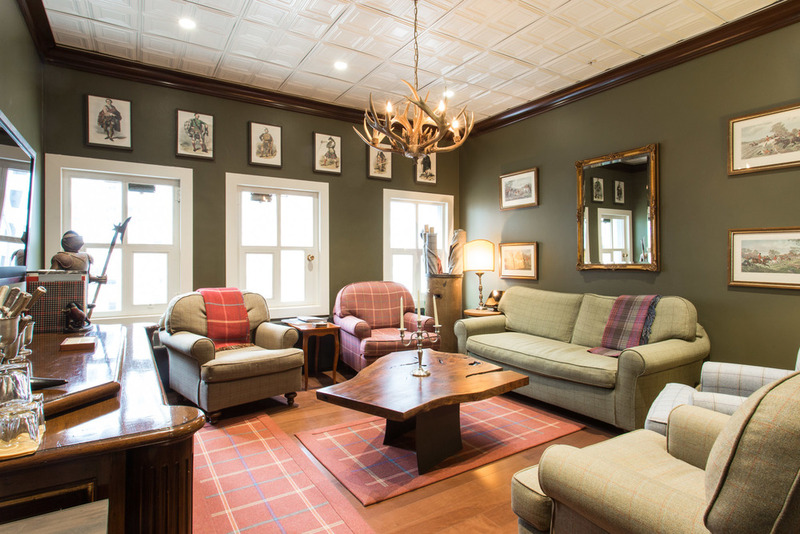 One of the most popular amenities at Wingtip is our private parlor rooms. Seating four to eight, each parlor room has its own distinctive menswear-inspired theme, drawing from our store origins. Set the tone of your meetings with the help of our Bluetooth speakers. Impress your guests with our Electric Mirror TVs which can be used as  a television,  a projector for a presentation, or  a discrete mirror. Two of the parlor rooms are ideal for dining, while the other two of the parlor rooms are more suited for lounging. In addition, two rooms have Darafeev game tables, should competitive instincts take over. Reservations are recommended but are otherwise on a first-come, first-serve basis. While we expect members and their guests to enjoy wine throughout the club, we have dedicated 2,500 square feet to wine-inspired amenities. No TVs. No cocktails. Just a 2,000 bottle, temperature-controlled wine cellar designed by Thomas Warner, a bar designed for members to share their wine with others, and a temperature-controlled wine locker room for members’ storage. Occasionally, you'll see champagne sabering or port-tonging. And by occasionally, we mean nightly. Wingtip members have the option of renting a wine locker in the temperature controlled Wine Locker Room. Lockers can be rented to store 6, 12, or 24 bottles of wine behind lock and key. Enjoy your special bottle of wine at the club, or grab one before heading to dinner at a nearby restaurant. Our events program is a reflection of our members: vibrant, diverse, and suited for every occasion. For those looking to network or make new friends, there is no better way within the Club than participating in the robust social calendar we organize. Whisky and wine tastings happen weekly. Foodies will enjoy our budding caviar program and quarterly supper clubs. And for the competitively inclined, we offer card and billiards tournaments. But nothing better defines life at the club then our two landmark parties. Our annual holiday gathering, the Sinatra Party (celebrated faithfully on his birthday of December 12th), and our Spring celebration of Ian Fleming's birthday. Neither is to be missed. The historic Bank of Italy building, built in 1908. Home to a century's worth of San Francisco history, and now to Wingtip. The Club occupies the two penthouse floors at 550 Montgomery in the original Bank of Italy Building. Constructed in 1908, it remains one of the oldest and most recognizable structures in the Financial District. The Bank of Italy would later become the Bank of America and the building would go on to be classified a national historic landmark. For six decades it stood before the arrival of its famous neighbor, the Transamerica Pyramid. The Club has not been in existence since 1908, but we can't help but be inspired by the provenance of the space. All 22,000 square feet of the store and the Club are intended to inspire and instill a sense of timelessness. From our main bar to the roof deck, the Club is a place to be apart from the city and absorbed by it all at once. Wingtip continues to evolve. We welcome members who will revel in our old traditions and introduce a few new ones of their own. 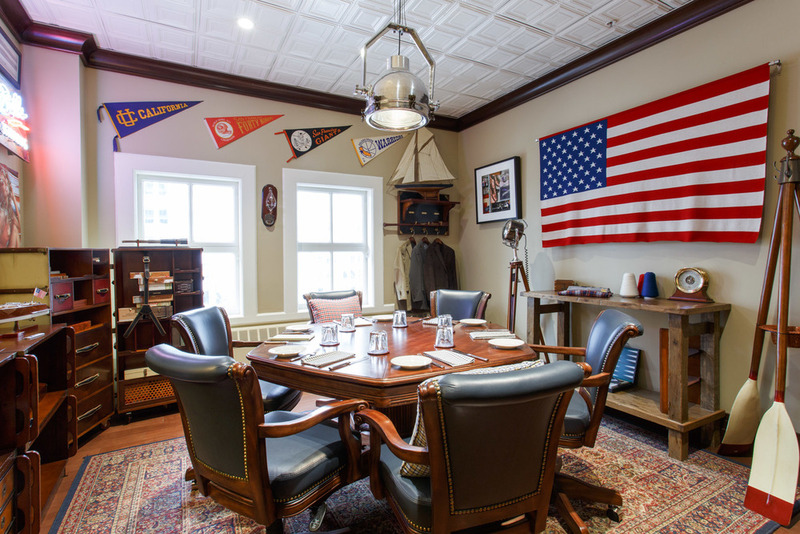 Ignore the stigmas of a social club, and experience life at Wingtip. ...or see our most frequently asked questions.